Today you will notice more high cirrus clouds in the sky. This is often the first sign of a change in weather... and this is no exception. 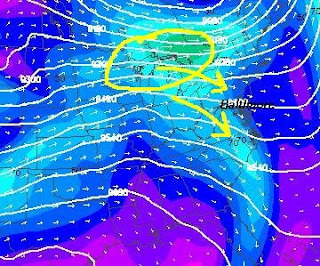 The same High Pressure responsible for Monday's great weather- slides off of the coast and allows a wind shift to warm us up. But we have to look at the upper level winds to see where these clouds are coming from... Here is the 300mb (roughly 30,000 ft) map. Here the wind flow becomes quite apparent- from the northwest. The cluster of storms I circled in the Great Lakes actually threw it's clouds southeast in our direction overnight. More showers in the Ohio Valley are responsible for clouding things in VA and NC. So today we will see clouds mix in- but the high altitude cirrus should allow the sun through. As the gradually increase by evening and overnight- it will mark the showers getting closer and holding out temperatures up. From here on in, our nights will get progressively more muggy and stay in the mid 60s. Tuesday night could get tricky as a short wave will swing through and could provide some late night storms. This is the type of event that can actually develop after sundown and east of the mountains as it does interact with some more humid air. Any hint of a southeast surface wind would be our trigger. This 700mb map shows this swinging through MD after midnight and by daybreak. What happens with this could set the stage for what follows on Wednesday itself. If we get clobbered early, it could stabilize the atmosphere. However there may be more support for afternoon convection. The Storm Prediction Center has us in a slight risk for severe weather on Wednesday, so stay tuned.